DOWNLOAD Over 190 Drum Samples w/ Free Upload! Neptunian Drumz 2 is ModernBeats prized sequel soundset that features more carefully crafted & unique Neptunes style drum kits. Download over 72 ambient pharrell kicks, 60 neptunes claps & snares, and 60 hot percussion samples packed with r&b hip hop flavor. Each of the 6 multi-format Neptunes drum presets included in volume two contains 12 kicks, 10 snares, and 10 percussion samples resulting in over 190 samples per set! Purchase the whole Neptunian Drumz collection (Volumes 1, 2, & 3) and own all 216 kicks, 180 snares, and 180 percussion sounds & watch your beats blow up! 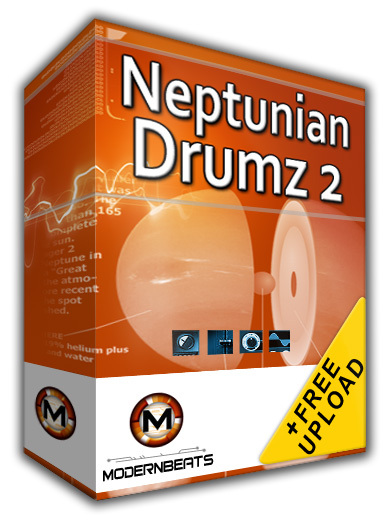 Neptunian Drumz Formats - All 3 Neptunian Drumz soundsets each feature 7 formats total for auto-loading into your software sampler of choice: Reason NN-XT (.SXT), EXS24 (.EXS), Kontakt (.NKI), Battery (.KIT), Halion (.FXP), Soundfont (.SF2), and WAV (.WAV). Compatible with FL Studio, Fruity Loops, Acid Pro, Logic Pro, Cubase, Reason, & Pro Tools.